During the spring and fall when I do a lot of traveling, I don't have time for all my usual family duties. One job I get out of is driving kids to various events and activities. It's a job I'm happy to let go of. Of course when I'm not traveling, I have to make up for lost time. This past weekend I felt like an Uber driver in training. All the driving I missed this spring was crammed into one weekend. On the upside I love spending time with my kids, and we have some interesting discussions while driving around town. On the downside all that driving really cuts into my knitting time. Over the weekend I managed to knit a little in between picking up and dropping off, but my main focus was starting a new project . . . over 300 stitches with a provisional cast on. I use a couple different methods when the situation calls for a provisional cast on. My favorite method doesn't work well with a large number of stitches, so this time I used my second favorite. 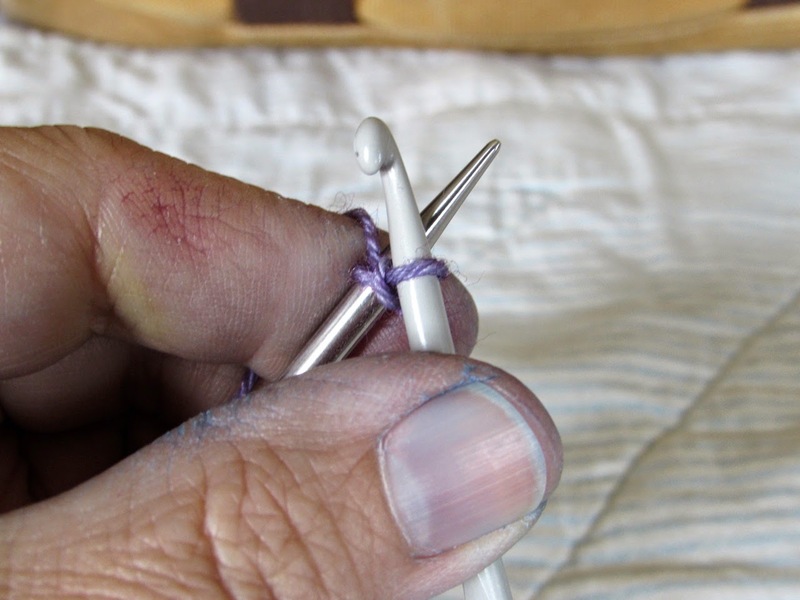 Using smooth waste yarn, place a slip knot on a crochet hook the same size as the project knitting needles. 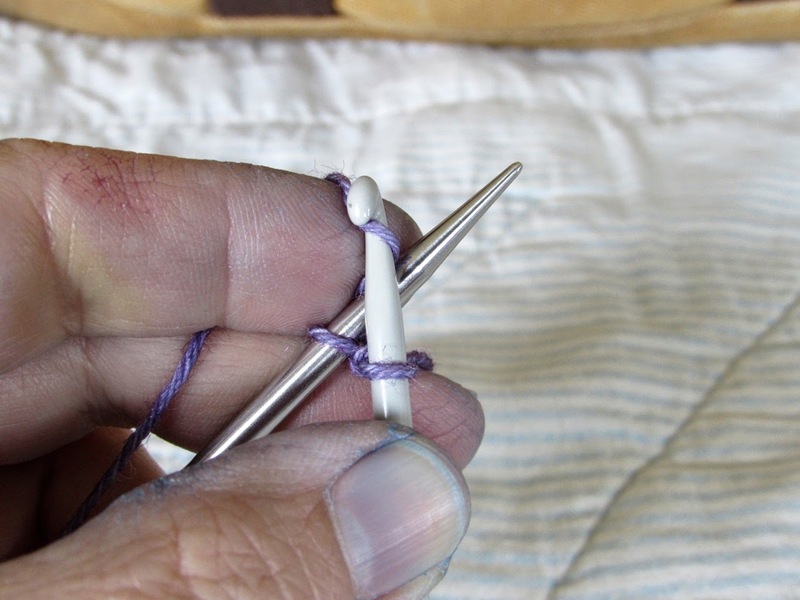 Hold the crochet hook in front of the knitting needle with the yarn behind the knitting needle. Excuse my dye-stained hands. Dyeing can be a messy job. 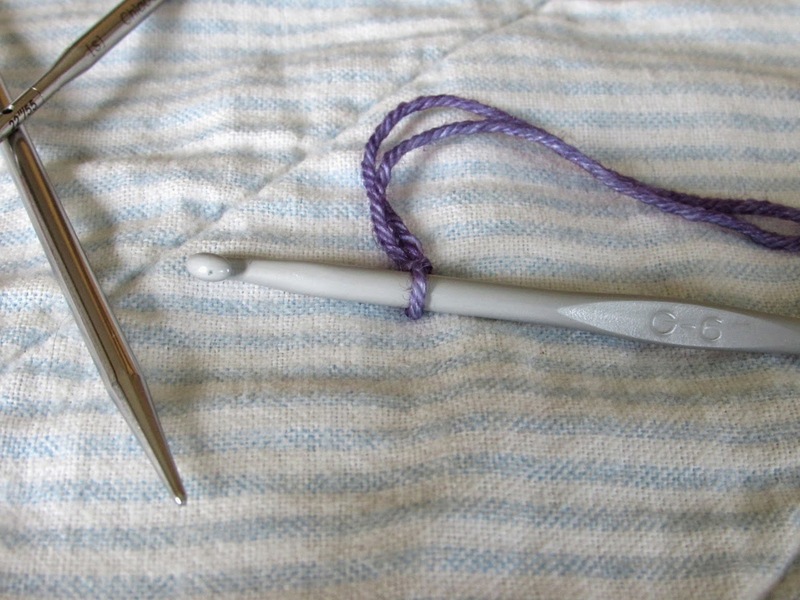 Bring the yarn forward and wrap it around the crochet hook. 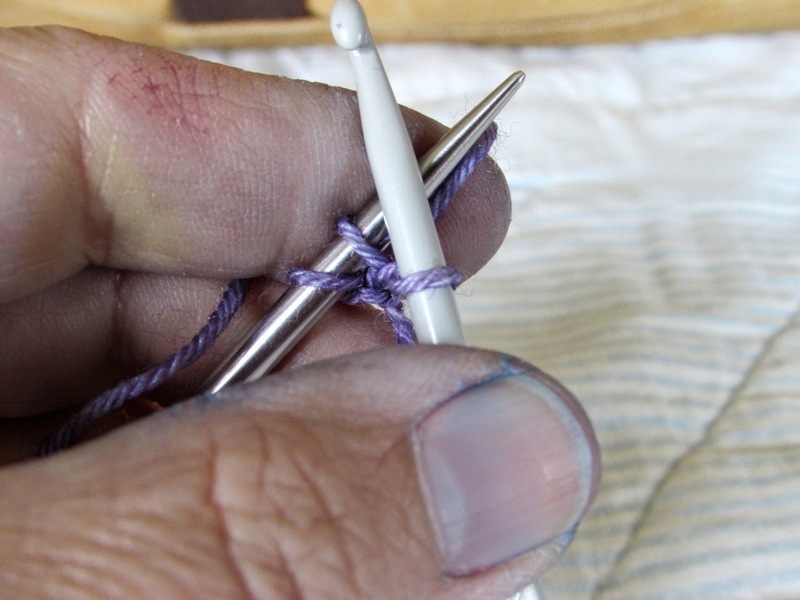 Pull the strand through the loop on the crochet hook. 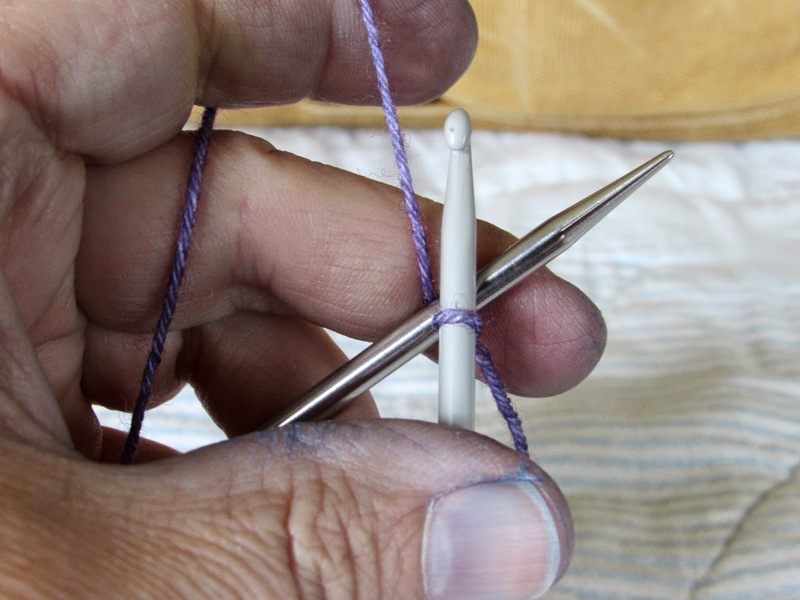 You've created one stitch on the knitting needle, and you still have a loop on the crochet hook. 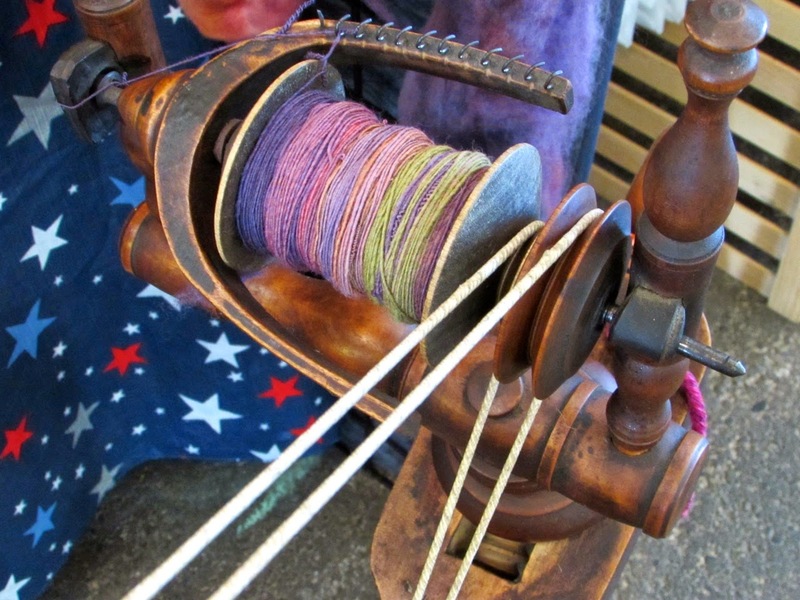 Move the yarn behind the knitting needle and start all over. 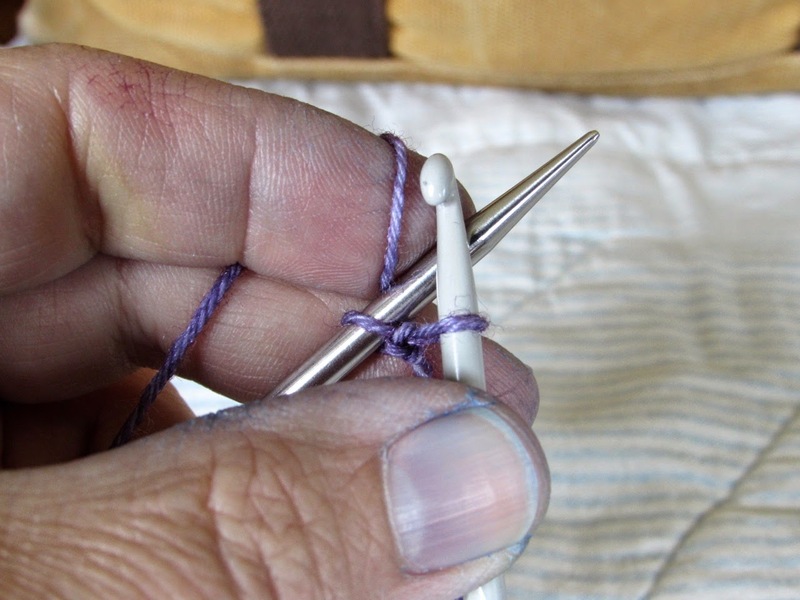 Now there are 2 stitches on the knitting needle. 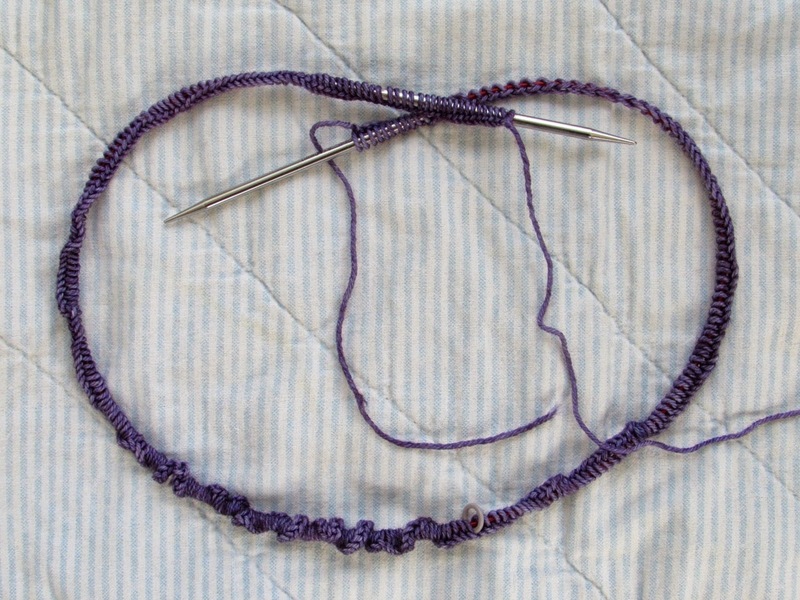 Repeat over and over until you have 1 stitch less than the required number. 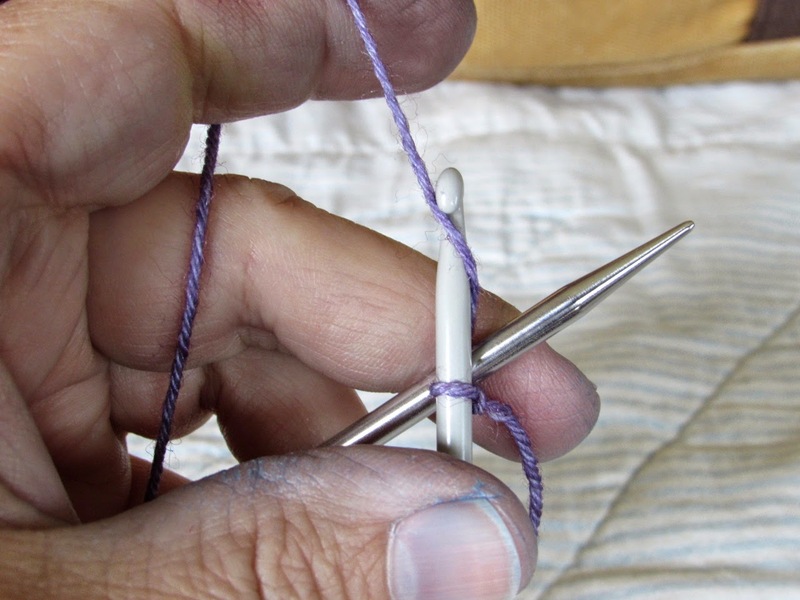 The stitch on the crochet hook becomes your final stitch. 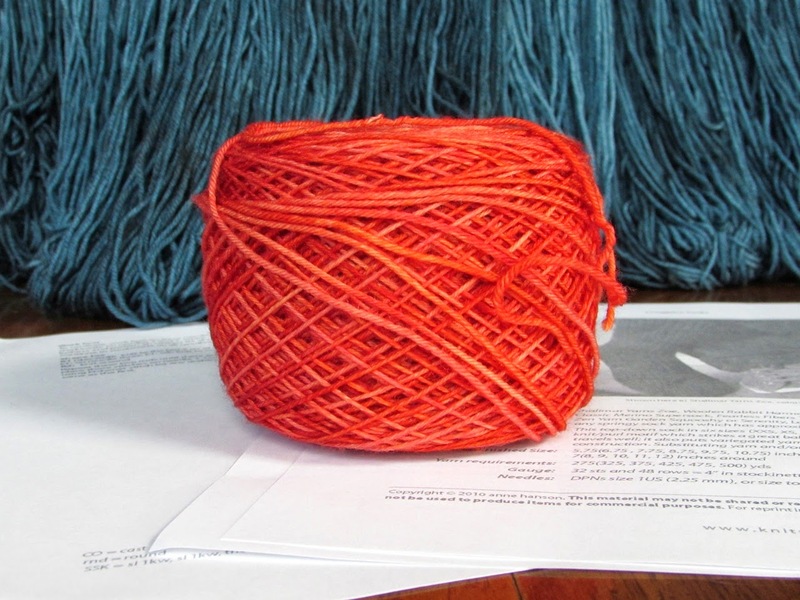 Drop the waste yarn and begin working with the project yarn. 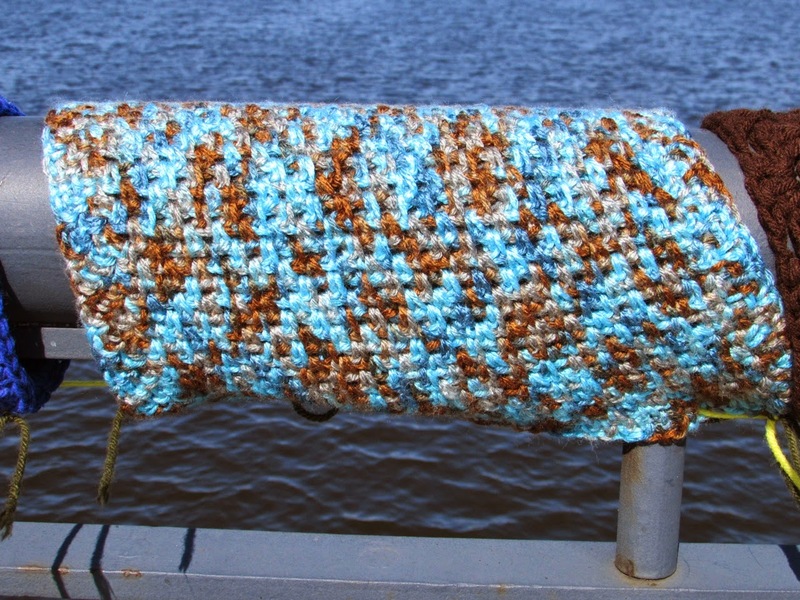 When you need to expose the live stitches, simply remove the waste yarn. And now the fun begins. What's your favorite provisional cast on? I know many knitters who are enthusiastic about knitting sweaters but always seem to get bogged down when it's time to knit the sleeves. 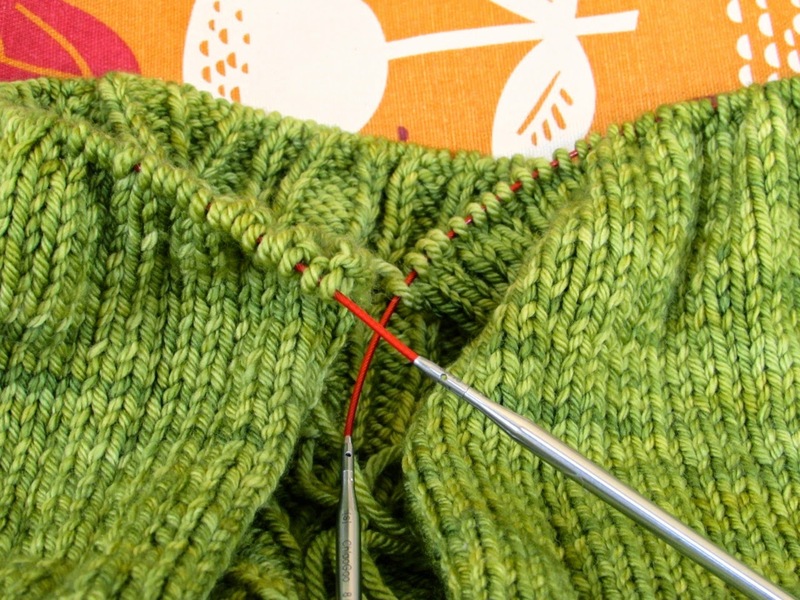 Even the most dedicated knitter can lose interest when knitting sleeves. There are whispers of "second sleeve syndrome" and "oh, they take so long." I've had similar comments when someone finds out I'm knitting sleeves. I've heard "that's the worst part" on more than one occasion. I'll admit that my sleeve knitting time is probably below average. I routinely struggle with the high shelves in my kitchen, but sleeve knitting is one instance where I reap the benefits of having short arms. In fact it might be the only benefit to having short arms. Sometimes you have to put it all in perspective. I've been working in the round on a pair of sleeves. Around and around and around I knit. It's really no different than a simple sock without all the twists and turns to make it fit your foot. I knit socks all the time without giving it a second thought. Why should these sleeves be any different? 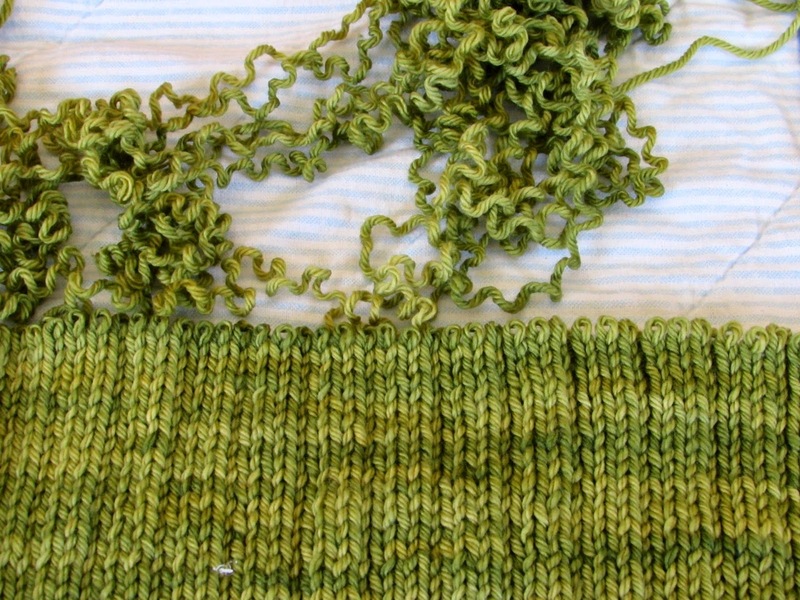 As soon as I latched on to that notion, the sleeves were done. 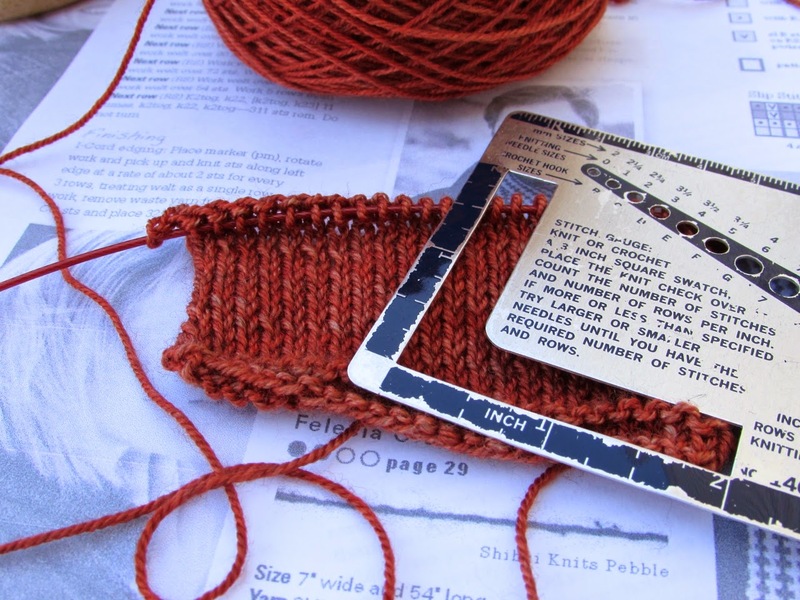 Now they're joined to the body of the sweater, and this project has quickly moved from portable to bulky. I've designated it a stay-at-home project. 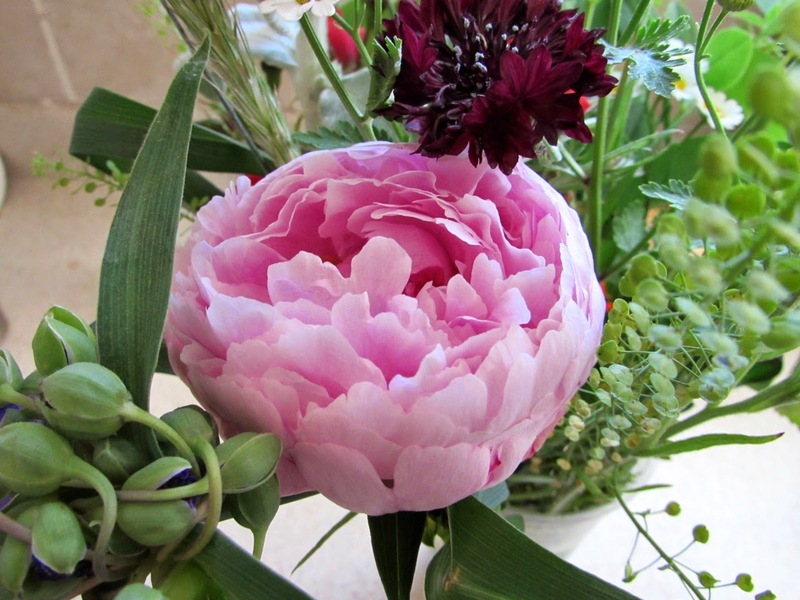 This week I treated myself to a lovely little bouquet, and it's provided my color inspiration for the week. Thanks for all the birthday wishes yesterday. I took the day off as much as I could and had a relatively quiet birthday. I tried to keep my time on the computer to a minimum but did allow myself a little time to look at patterns. 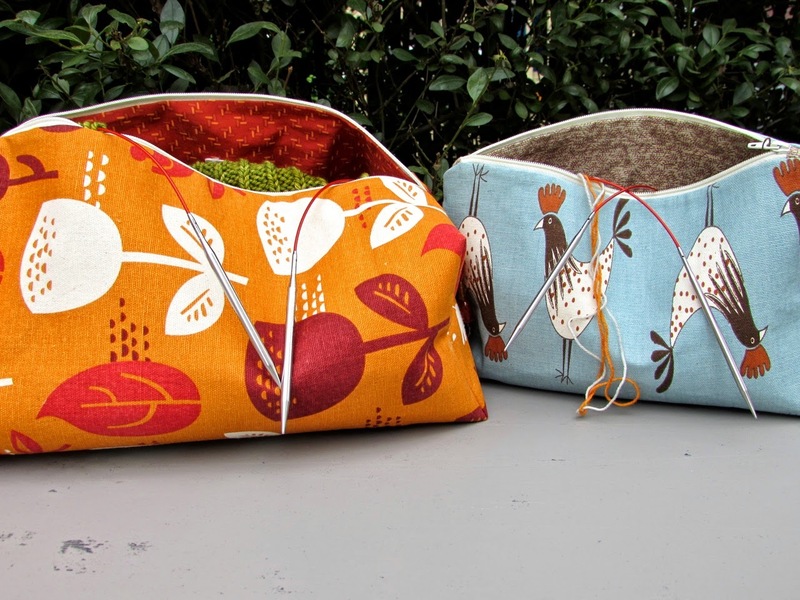 Of course I found several designs that struck my fancy, but one in particular was calling out to be first in line. The cry of "drop everything else and cast on now" was loud and clear, but I got hung up on one small detail. I couldn't decide which yarn I wanted to use. The more I pondered it, the more stuck I got - like spinning my wheels in the snow. I've learned my best strategy in situations like that is to walk away from it. Let go and move on . . . which is what I did. 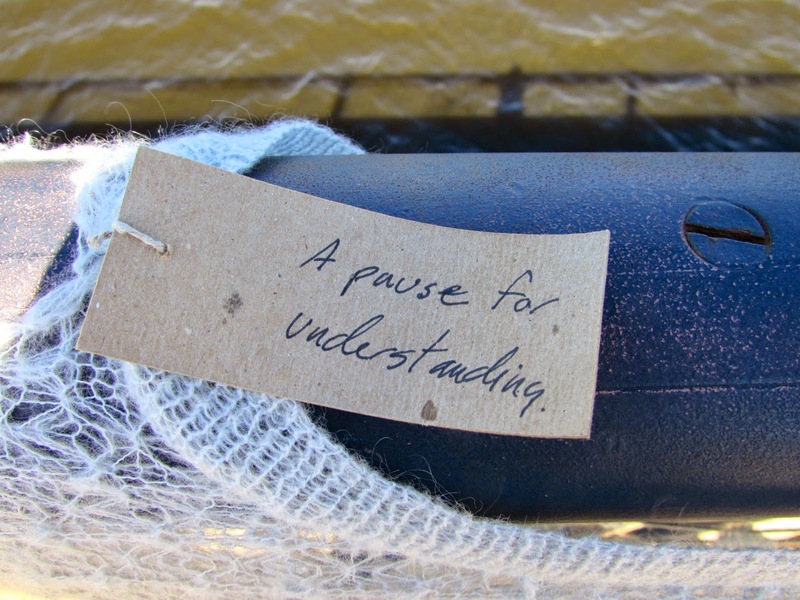 Sure enough, later in the day when I wasn't thinking about the new project, all was revealed. I knew I had to use Crystal. It seemed only fitting that I treat myself to a yak blend on my birthday. 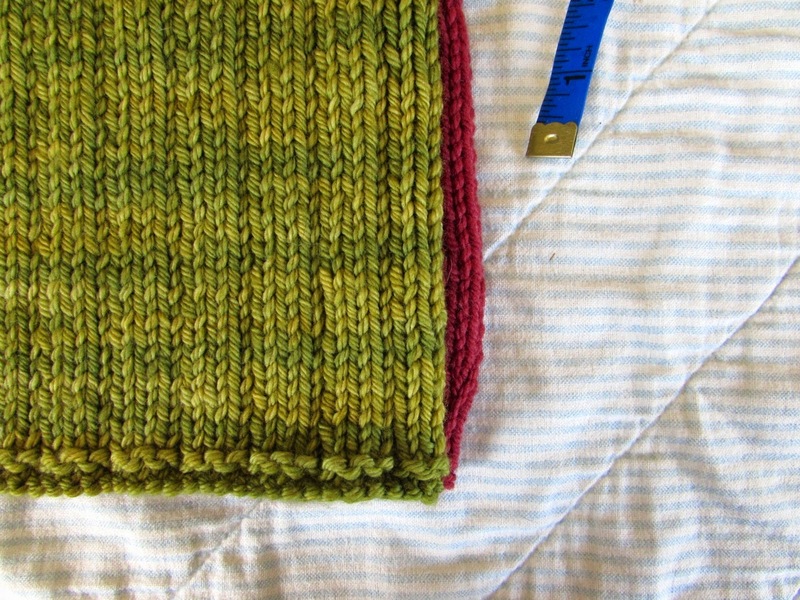 Yesterday I had just enough time to knit a small swatch. Today I'll size it up and cast on. This is the birthday gift that keeps on giving. If you read my blog regularly, you might have noticed that I consistently post on Mondays, Wednesdays and Fridays. I've been known to make slight adjustments for major holidays or an extra crazy travel schedule, but for the most part you'll find an update here on those three weekdays. I don't have much control over the rest of my schedule, so it's comforting to know that I'm in charge here on the blog. Today is Tuesday, so why am I posting? Today is my birthday, and I decided it would be the perfect day for the monthly giveaway. And since it's my birthday, I'm making this a bonus month by picking 2 winners. Double the fun all around. 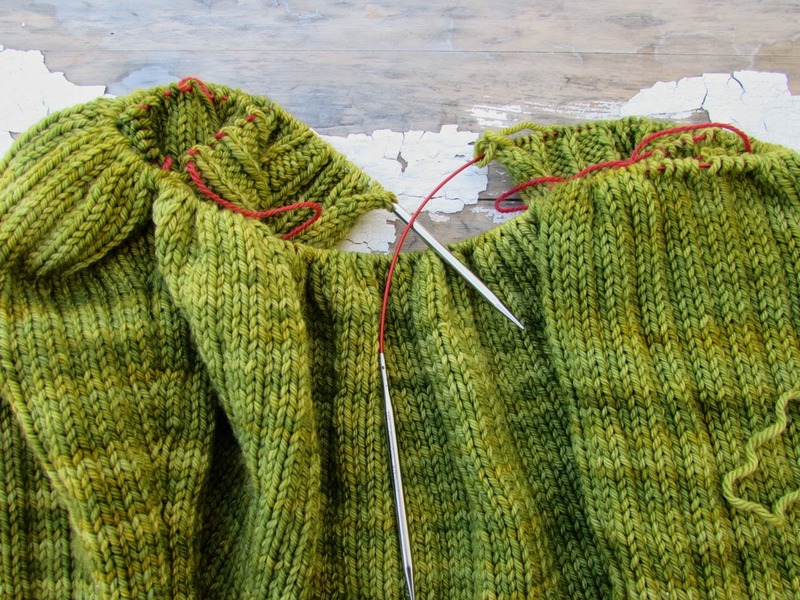 Leave a comment with an update on your knitting progress. Or mention a pattern or yarn that's caught your interest. Or share what you plan to work on over your summer vacation. 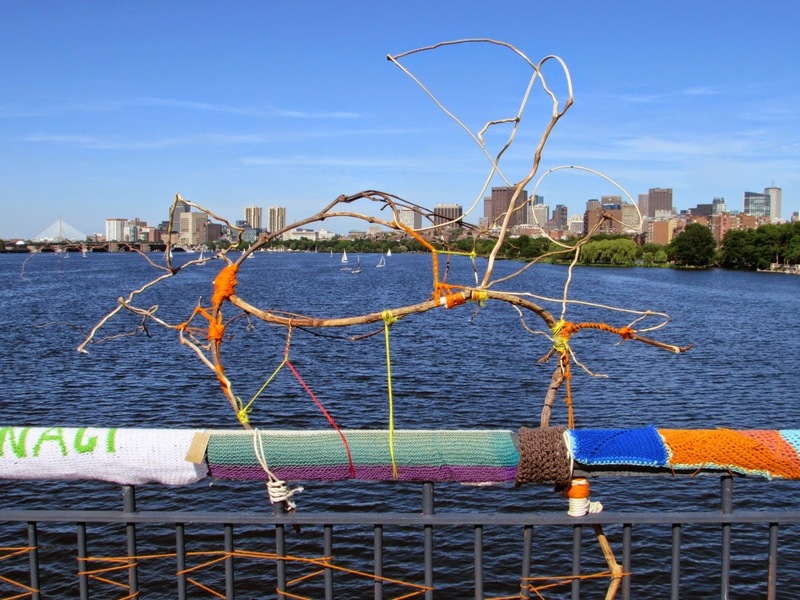 The winners, chosen at random, will each receive a skein of yarn of their choice from Dirty Water DyeWorks. The contest closes on Monday, June 30, 2014. One other bit of news. The fall issue of Knitscene was released yesterday, and one of the designs uses my Clara yarn. 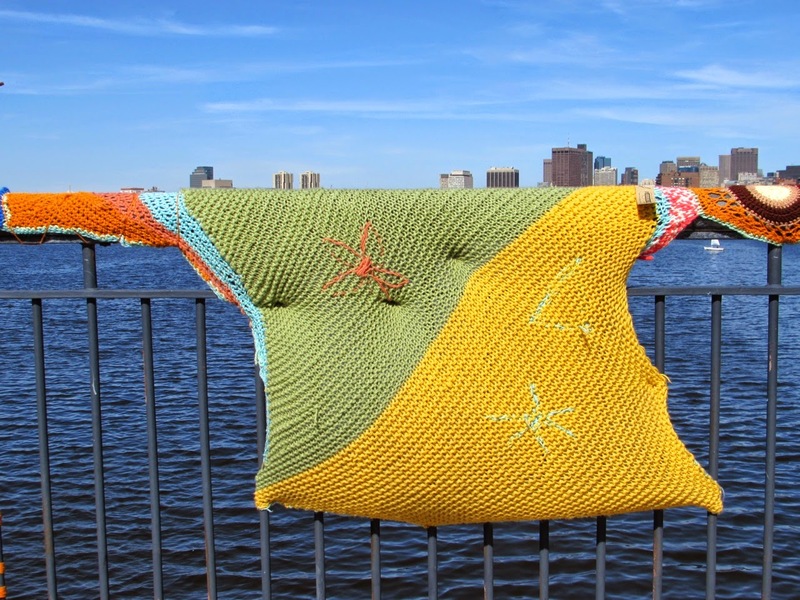 Block Island Sweater is designed by Allyson Dykhuizen, and she chose one of my favorite color combinations. This issue is full of fun and interesting designs. I'm sure I'll be browsing more later today. That's all for this birthday edition. Back to your regularly scheduled Tuesday . . . The longer daylight hours this time of year can be deceptive. The days are still 24 hours long, but somehow the additional light during those 24 hours makes it seem like I have more time. Or at least like I should have more time. But of course I don't. My weekend started out with plenty of knitting time penciled in, but then things went awry. There was the long distance call from a friend traveling in Switzerland. Before she left, she forgot to take care of a couple things at her house. Could I stop by? But of course. Teenagers with changes in plans that required extra driving? I never say no. But at the thought of grocery shopping, I put my foot down. There's nothing I hate more than grocery shopping unless it's cleaning the bathroom. Instead, we foraged through the fridge over the weekend. It needed to be cleaned out anyway. 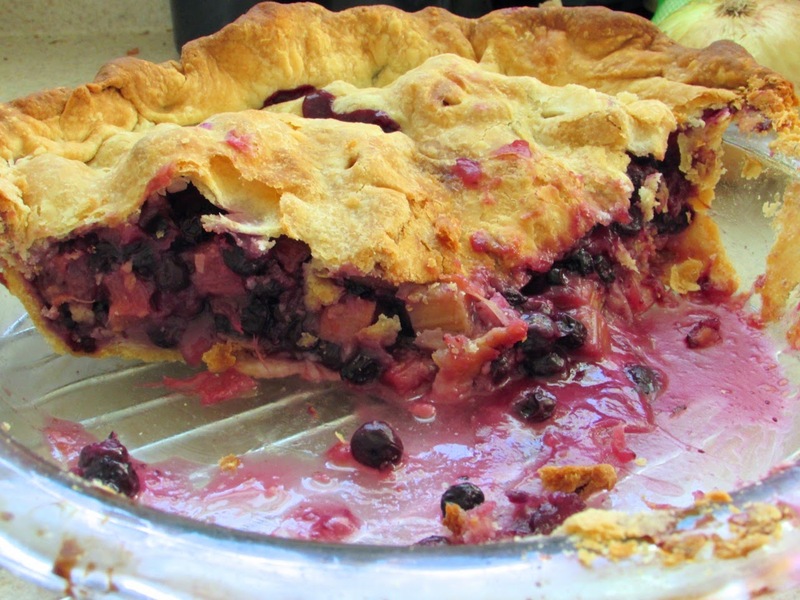 And that foraging led to a rhubarb blueberry pie, so it was worth it in the long run. This morning that pie has breakfast written all over it. And in the midst of all the driving and the pie baking, I found time for some knitting. It wasn't the uninterrupted knitting time I had planned on, but it was productive. Itineris. More stripes, more daylight and pie. I've been knitting along on my latest sock project in between a couple sleeves and a shawl or two. This strategy means I'm making steady progress on several projects, but nothing is close to being finished. That's the price I pay for bouncing back and forth. This morning, before I'd managed even a sip of coffee, it suddenly dawned on me that the sock was a knitting rerun. 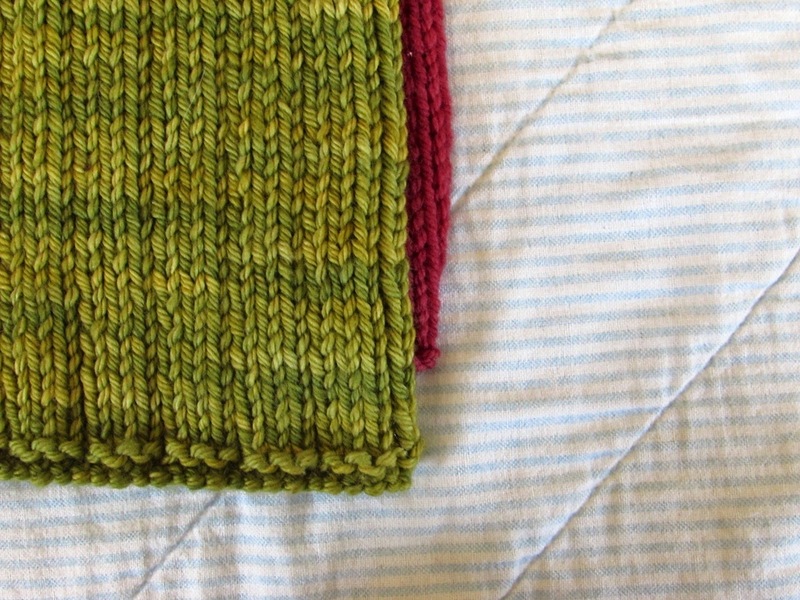 The stitch pattern for the sock is the same one that was used in a cowl I made this winter. For those who are curious, it's New Canaan. I'm even using similar colors. I don't know why it took me so long to put two and two together. I'm even more amazed I made this connection without one drop of caffeine. 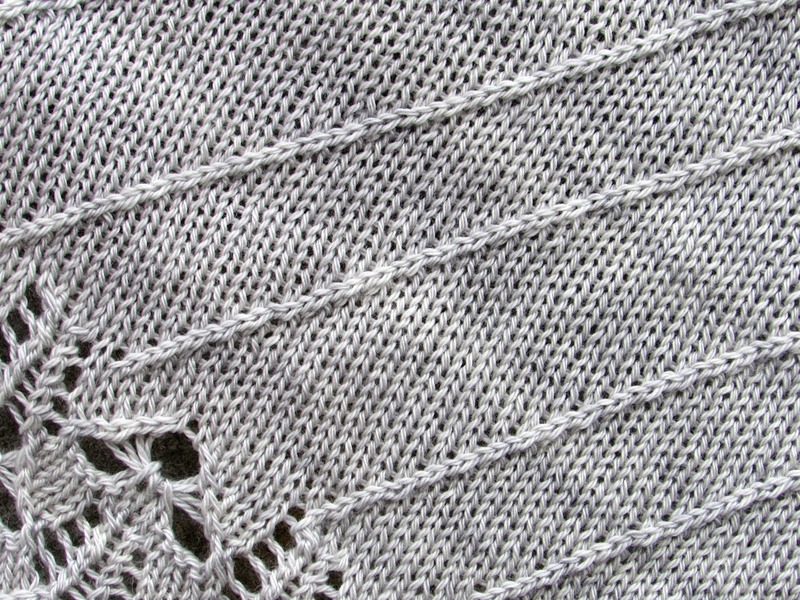 Earlier this spring I had a thing for 3 x 1 ribbing. Now this. It makes me wonder what's next. I've always appreciated peace and quiet in the morning, but I've had to make some adjustments. 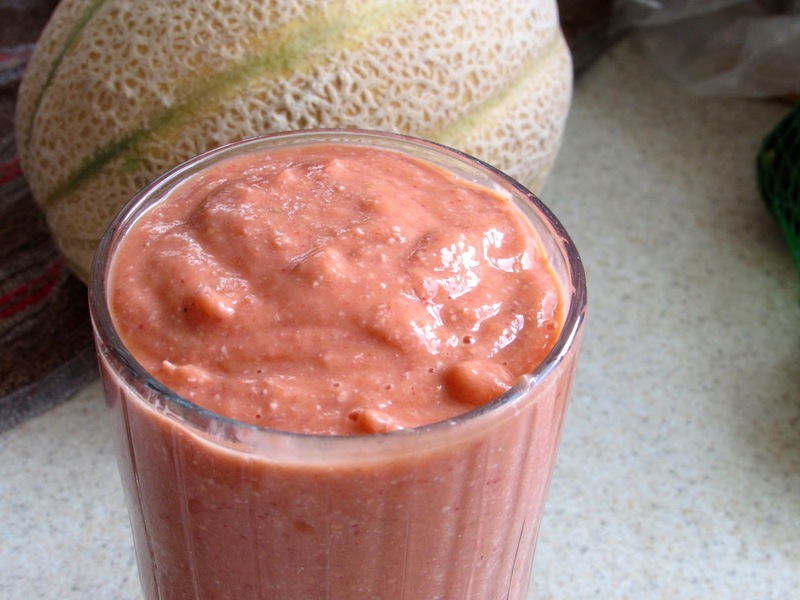 My son now has a morning ritual of making a smoothie, and I've slowly gotten used to the whir of the blender. I try to encourage self-sufficiency in the kitchen, so I don't say anything about the noise. He's always experimenting with different fruit combinations. This one caught my eye and is my color inspiration for the week. 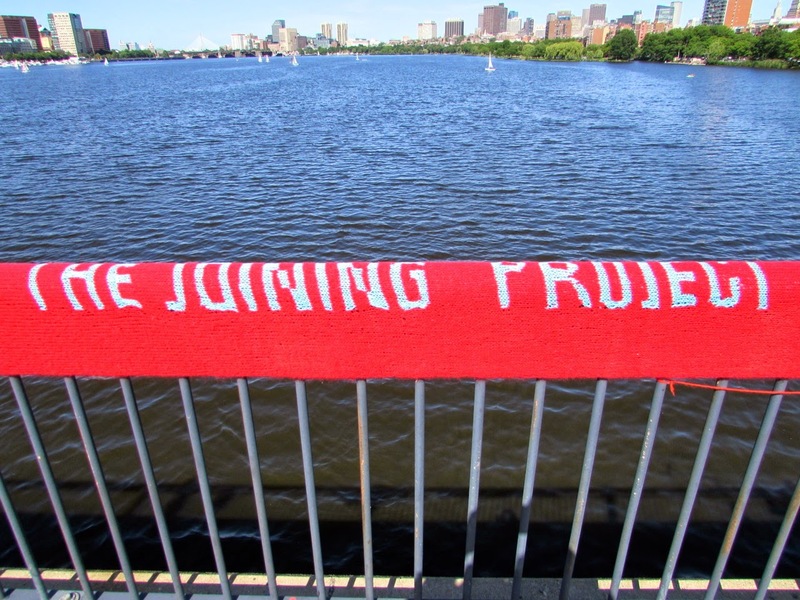 A quick update on my post from the other day about The Joining Project and the Mass Ave Bridge. 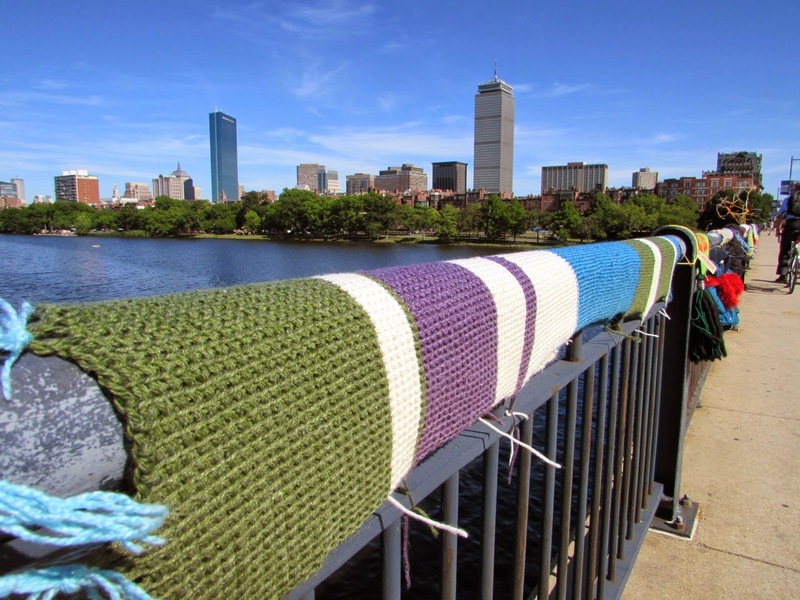 WBUR, one of our local NPR stations, did a story on it this morning. You can listen to it here. Down by the River . . . This past Sunday I was taking my usual drive through town. 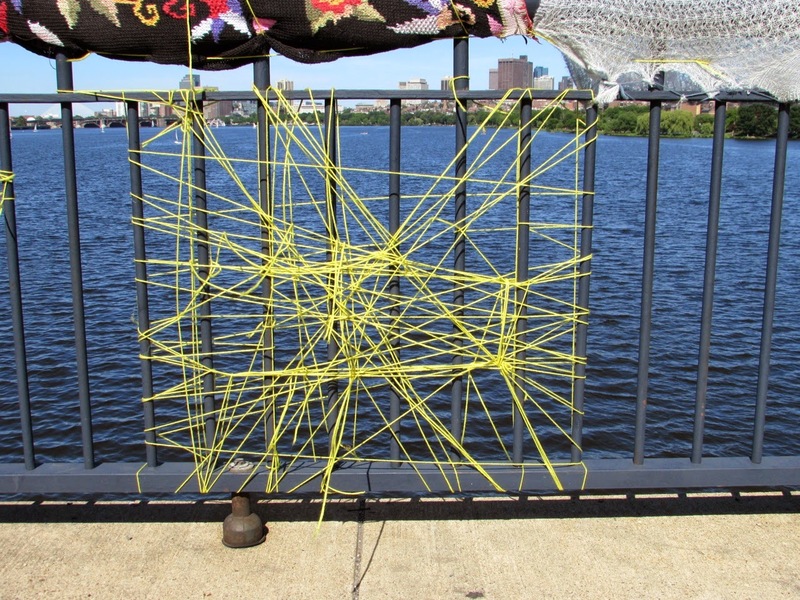 I was crossing the Mass Ave Bridge when I spotted someone decorating the bridge with yarn. Or at least that's what I thought I saw. I wasn't sufficiently caffeinated and thought maybe I was imagining the whole thing. I was scheduled to be someplace else but told myself I would come back and investigate further. Which is what I did. 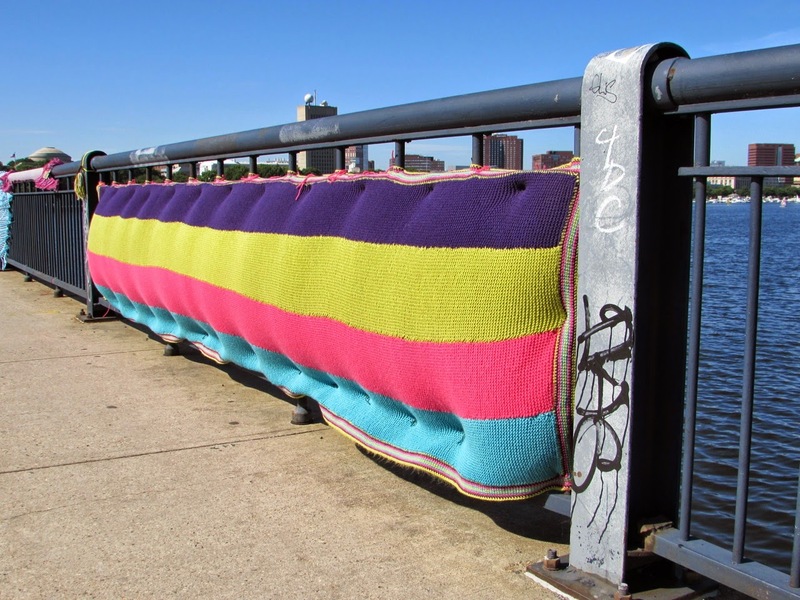 To my delight I discovered colorful yarn art along the bridge. 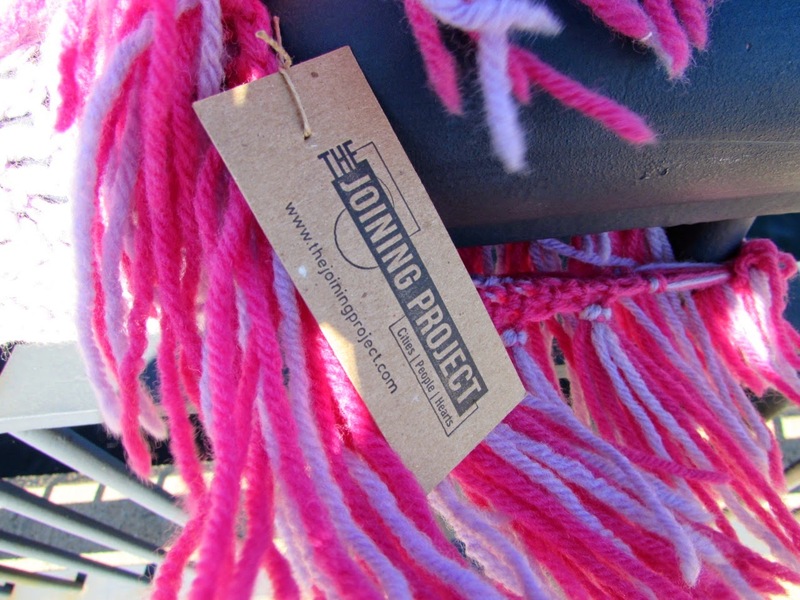 This installation is the work of The Joining Project. Here are some of my favorite pieces. Thanks to everyone who had a hand in this. 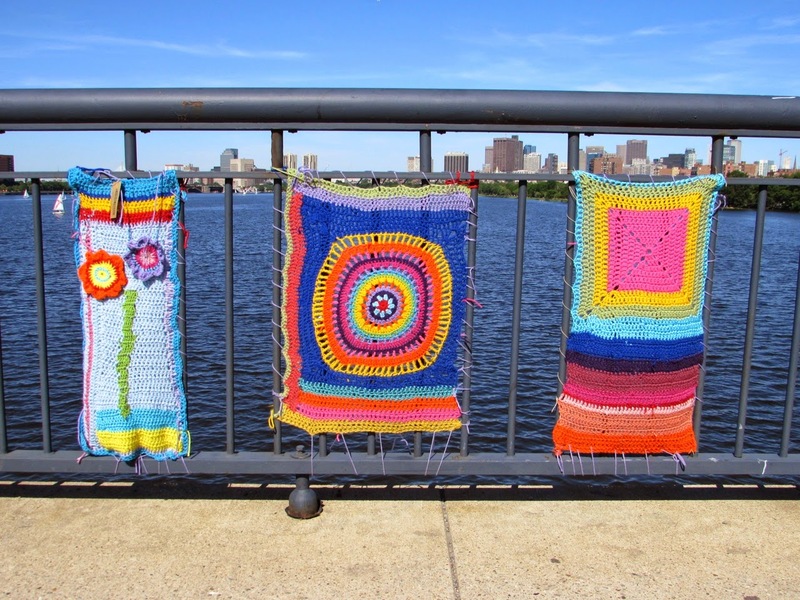 The inspiring, cheery yarn project along the picturesque Charles made my day. Some time ago I started a sweater. 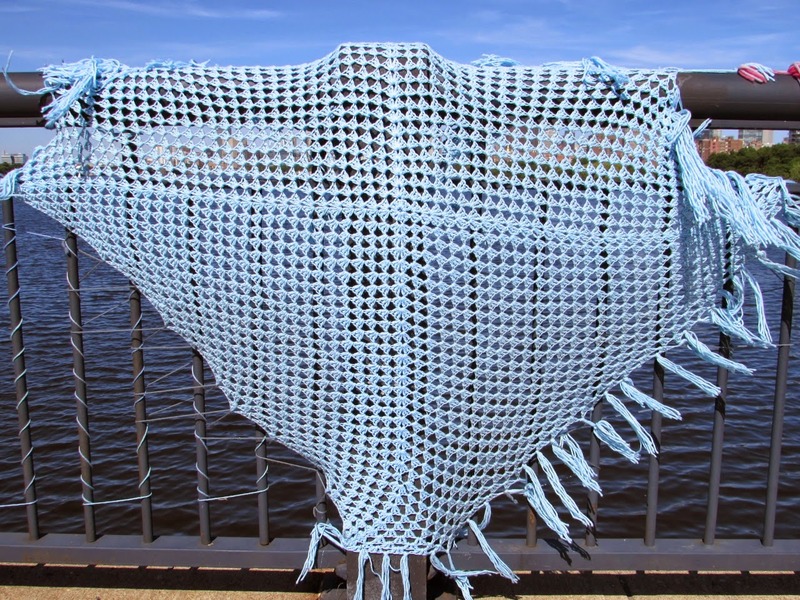 The design is worked from the bottom up with 3 x 1 ribbing, so it became my mindless project. I carried it around and diligently worked on it. I read the suggested length to underarm and knew I didn't need to make it that long but wasn't sure just how long to make it. So I kept knitting. You know that knitting. You're working along. You're sure you're not even close to the desired length. You're almost positive you'll never get to the desired length. Two weeks ago I had a feeling I should really figure out the desired length, so I set the project aside. 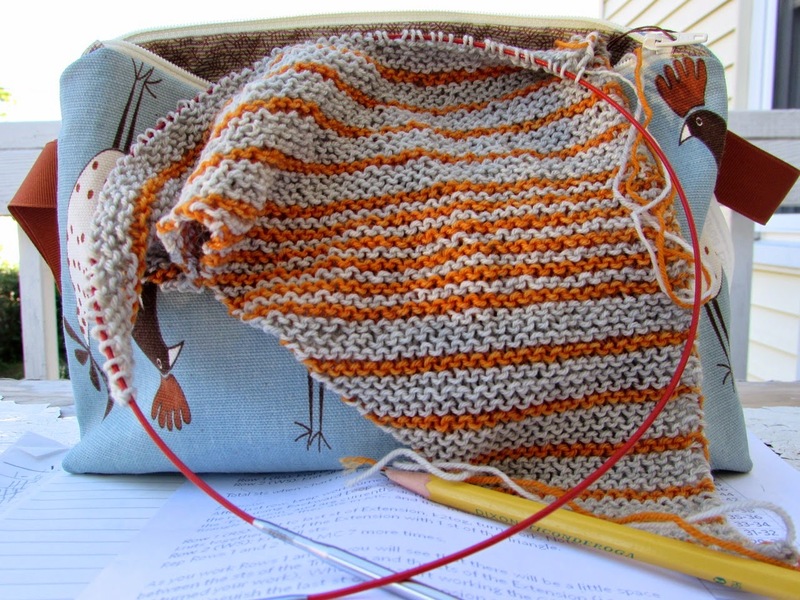 It was easy to let the sweater simmer because I was in the middle of a couple other projects. Once the other projects were finished, I was ready to turn my attention back to the sweater. Last week I grabbed it on my way out the door and realized I still hadn't resolved the length issue. The sweater moved from simmering to stalled. It's not a good time to sit down and sort out a sweater when I'm on my way out the door and running late. It's also not the time to do it when I'm sitting in an office, waiting for an appointment. One of my weekend projects was to get this sweater back on track. Since I wasn't sure of the exact length to underarm I was trying to achieve, I decided to measure it against another sweater. This is one of my most trusted methods for getting the correct length to underarm. It also works for sleeves and comes in handy when I can't find my tape measure. 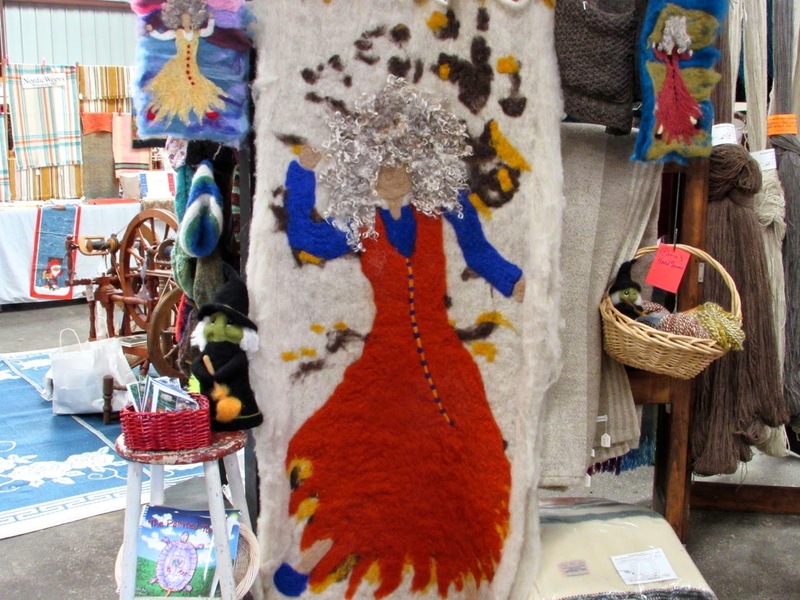 I like the length of the red sweater, and this little exercise confirmed that I had indeed shot past the target length. There's only one solution when that happens. I thought I might need to take out 6 rows but stopped with 5 just to be safe. Heaven forbid I go too far the other way and take out extra rows. And that was just right. This sweater has gone from stalled to up and running. 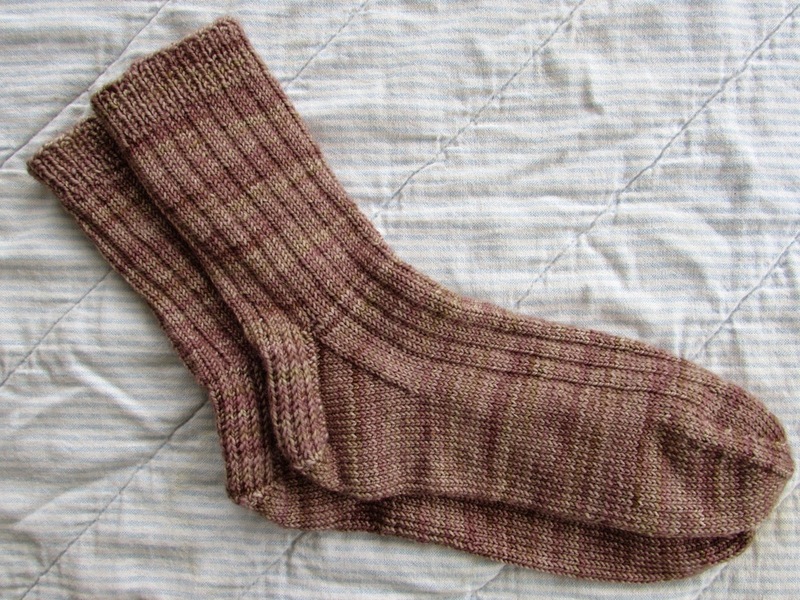 Recently I finished a pair of socks. These socks were perfect for on-the-go, almost mindless knitting. 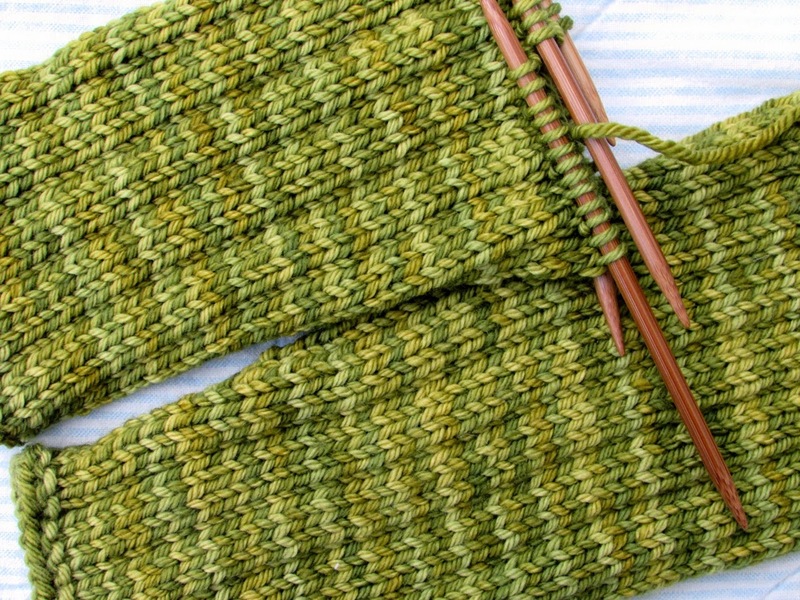 The stitch is 3 x 1 ribbing. Nothing fancy. I didn't really follow a pattern but try A Nice Ribbed Sock if you're looking for something similar. In case you're wondering, the yarn is Lillian, colorway Wheat. A while ago Stephanie of Yarn Harlot fame posted about her toe decreases. 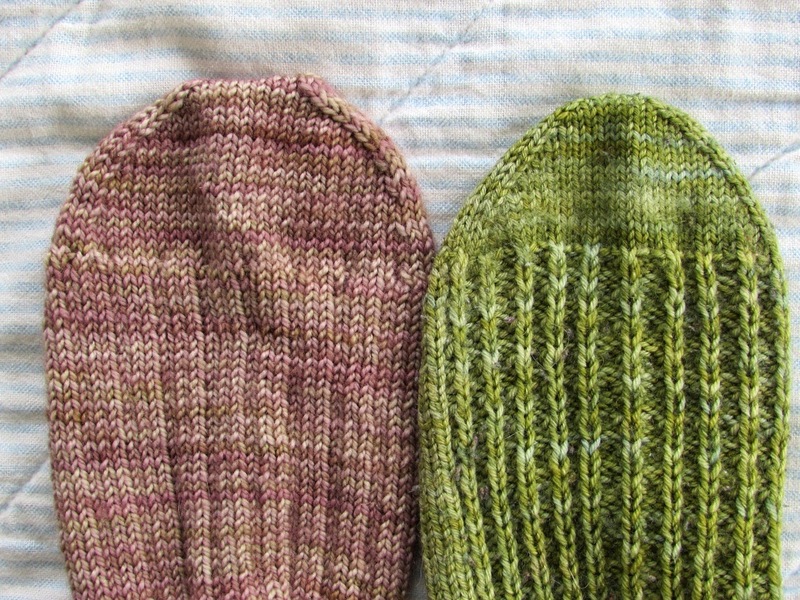 She spaces out her decrease rounds with additional plain knit rounds to create a more rounded toe. I made a mental note of the formula and told myself I would try it some day. 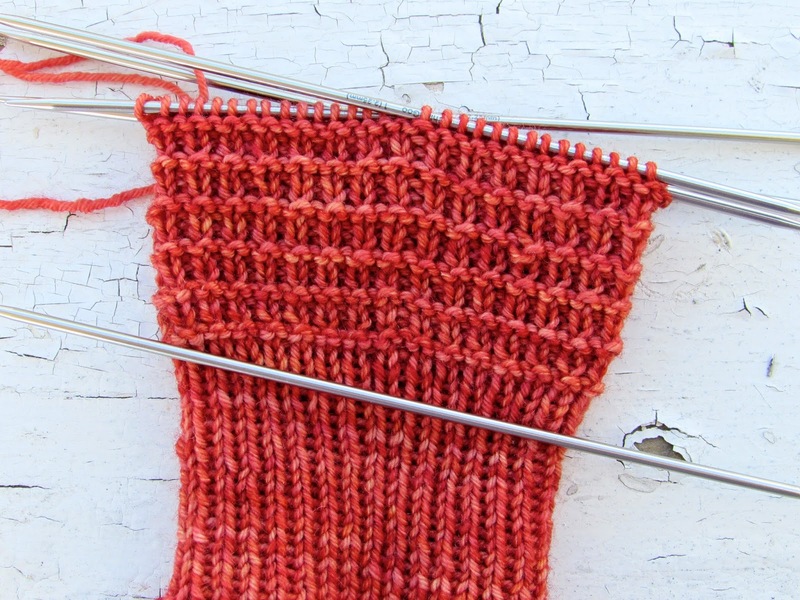 When I came to the toe of these ribbed socks, I decided to give Stephanie's method a try. I wasn't unhappy with my traditional toe, but I'm delighted with the outcome of the new one. For comparison, my traditional toe is on the right. Stephanie's toe has a comfy fit, and it reminds me of the bumper on Keds sneakers. A simple variation on a theme. I'm sure there are more rounded toes in my future. My color inspiration this week is highlighted by a contrasting backdrop. 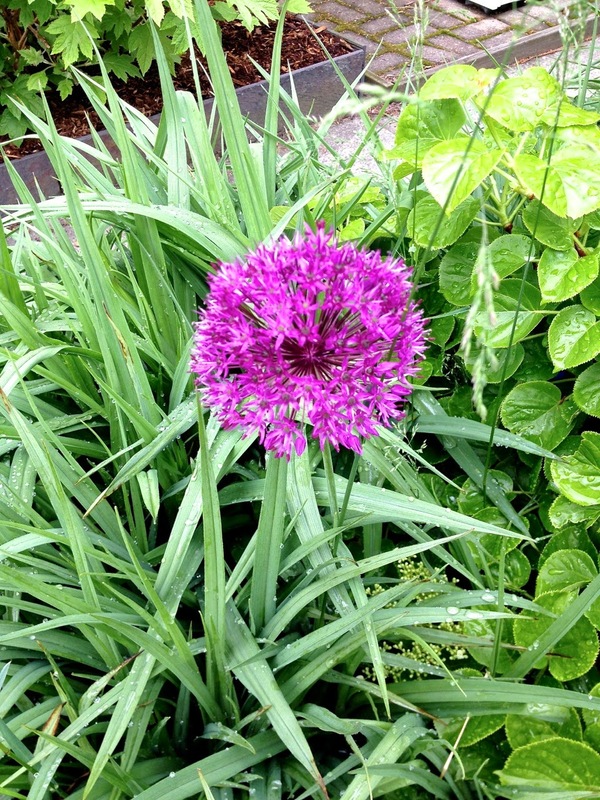 A ball of purple surrounded by green. I'm often finishing projects at the last minute, and one of these times I know I'm going to run out of minutes. Shows are my most pressing deadlines, and there's nothing like a deadline to motivate me to finish a project. Last Thursday evening, the night before I left for Fiber Frolic, I decided I had just enough time to block another booth sample. 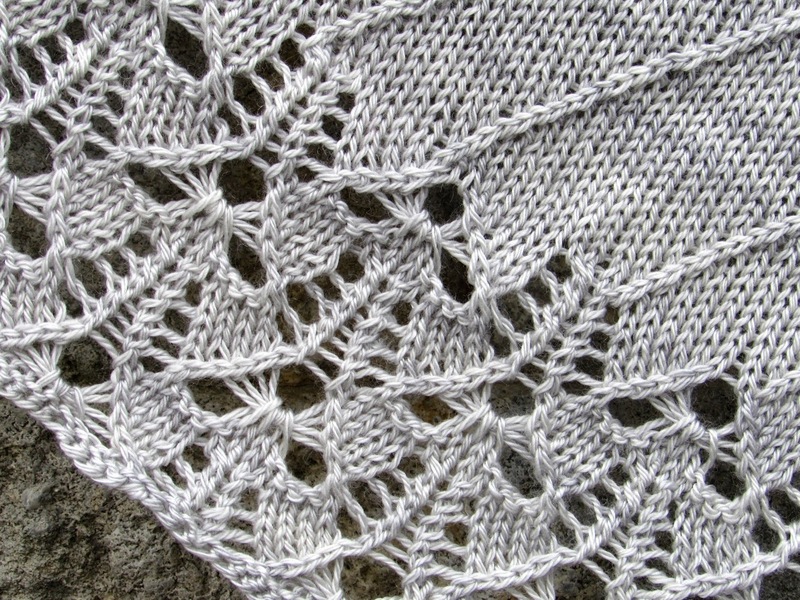 This is an interesting pattern with left and right crosses moving across the body of the shawl. 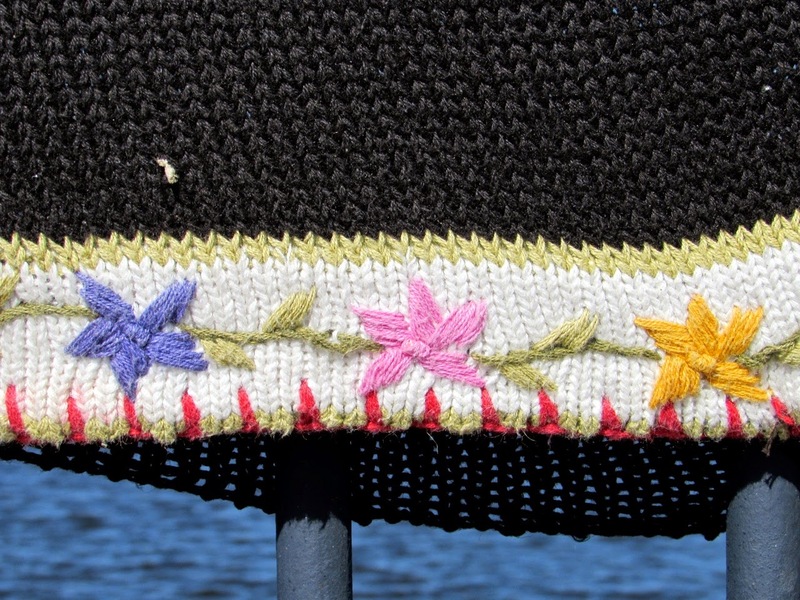 There's a certain rhythm to knitting the crossed stitches, and they add both texture and visual contrast. 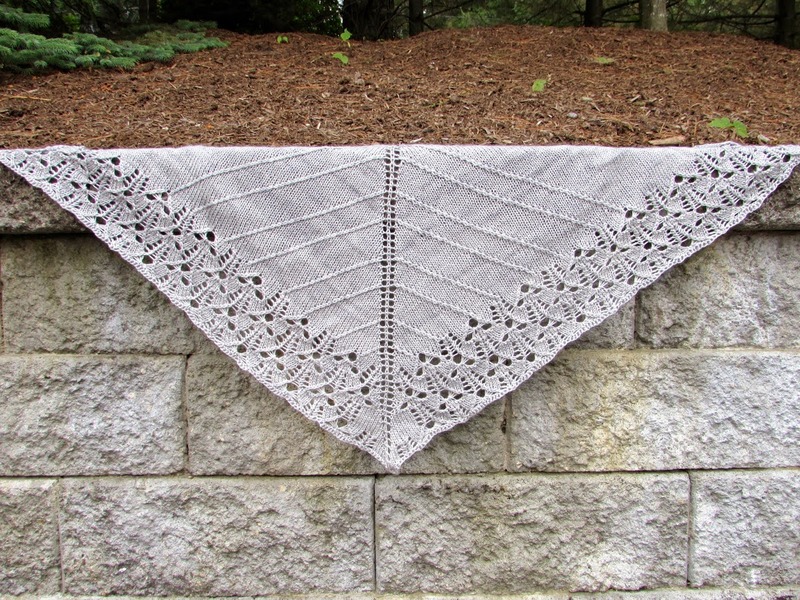 The border is full of twists and turns that can only be fully appreciated when the shawl is blocked. I'm delighted with the outcome. The yarn is Julia, colorway Silver. 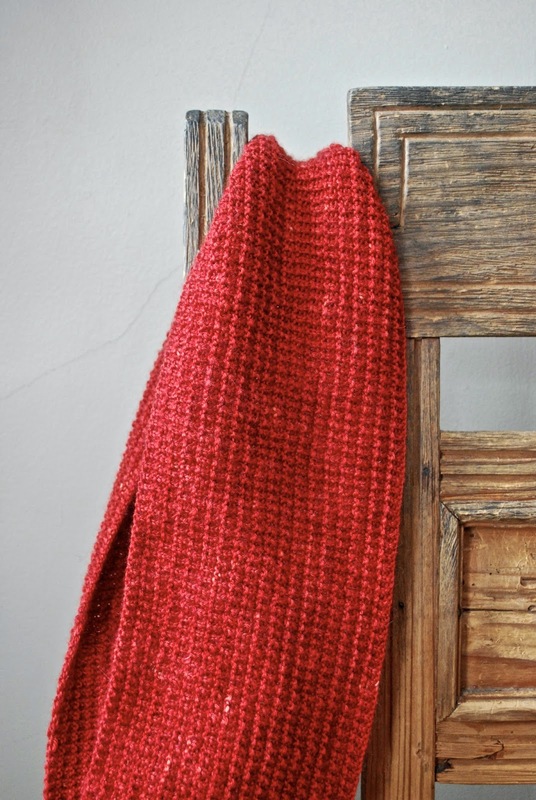 This blend of Merino and Tencel has nice drape with a bit of shimmer. The spring show season is over, but I'm still on the road. 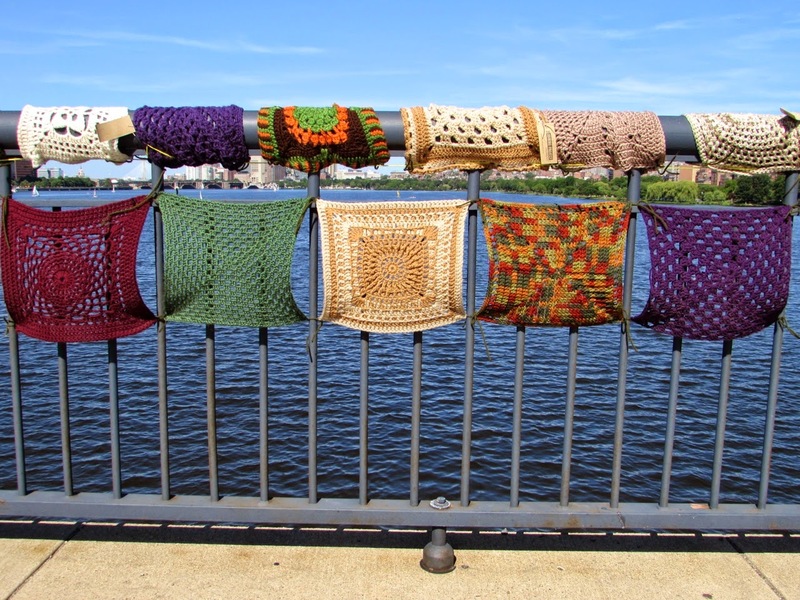 This coming Saturday I'll be Eneri Knits from 11:00 - 3:00 for a trunk show. If you're in the area, stop by. And now I'm off to knit . . . without a deadline. Mondays can be challenging, and after a weekend in Maine, this Monday is even more so. I could easily have been convinced to spend an extra day, but I don't have that flexibility with my schedule. It's Monday morning, and I'm back at it. 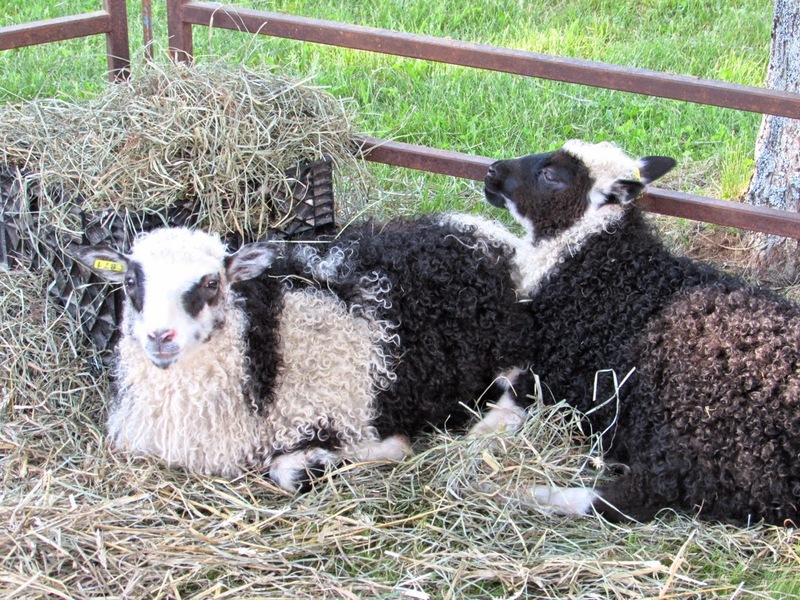 Fiber Frolic is always fun. 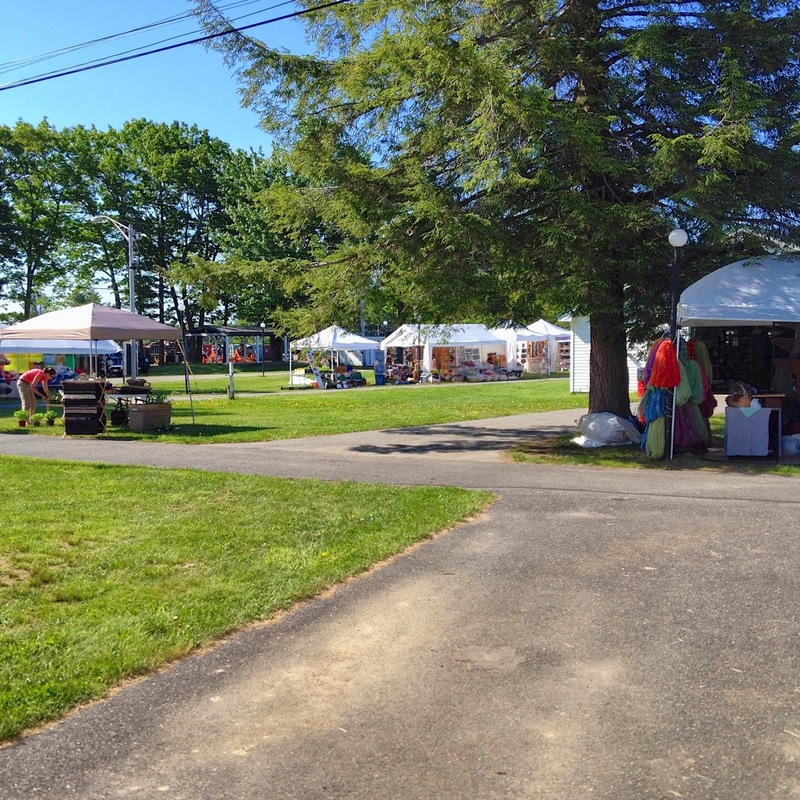 The pace is relaxed, so there's plenty of time to talk with customers and connect with other vendors. I don't have that luxury at some of my other events. Take a peek at the weekend. A few weeks ago I realized I didn't have enough project bags, but I was busy and didn't do anything about it. I'm glad I waited. Project bags from Three Bags Full. It didn't take me long to fill them. It's time for more coffee and maybe just a row or two. Today I'm leaving for a weekend show, so late last night I started to think about packing. I always pack my knitting first. Once that's in place, the rest is easy. Since I'm in the midst of a personal sock challenge and since socks are so portable, I knew I wanted to limit my weekend knitting to socks. When I checked in with my current sock in progress, I realized that it's almost finished and won't last the weekend. That means it's time for a new sock project. 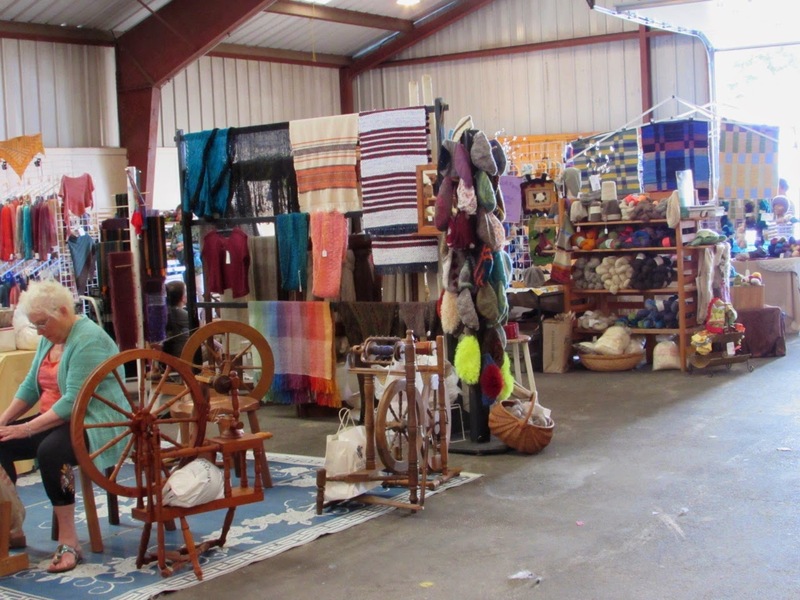 I'll be knitting in my booth this weekend, so one of the requirements is the pattern has to be simple - nothing too involved with a lot of cables, lace, charts and fancy maneuvers. The other requirement is that it can't be boring. Just because it's simple doesn't mean it has to be boring. I started my pattern search. I checked my usual spots - Ravelry, books, lists, files. Many of the simple patterns bordered on boring. It was getting late when I finally settled on this one - Longjohn Sock. I think this pattern has the element of simplicity without being boring. 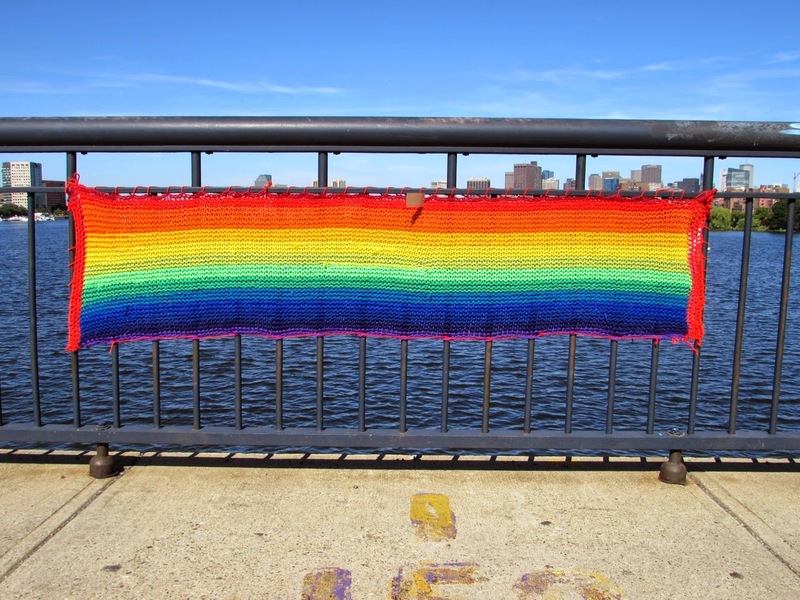 The Ravelry description says it's "fun knitting that travels well." I'll find out. I went to bed with an empty suitcase, but I had my travel knitting sorted out. Now that that problem is solved, I should pack some clothes. 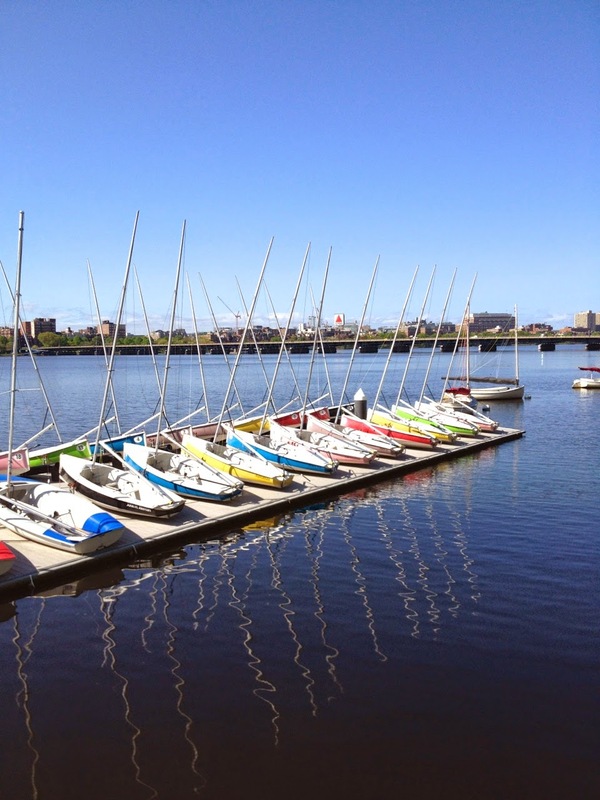 My color inspiration this week comes from the Charles River. I remember when that water really was dirty. 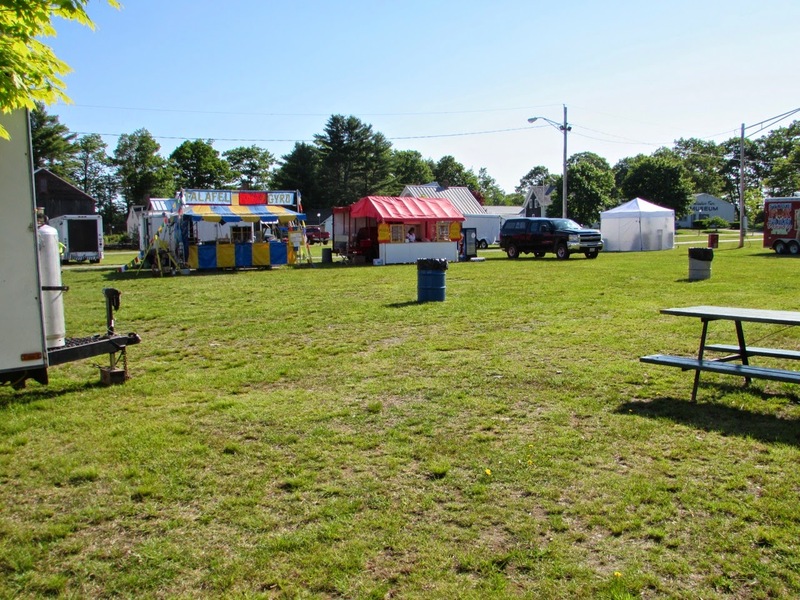 Today it's an example of the positive impact of clean-up efforts. Bright boats ready and waiting.